Account view shows all security principals and their folder access rights. Each account row can be expanded to see folders if it has any kind of permissions. Account row provides You with information like account name, display name, account type, description, department, manager, job title and Security Identifier (SID). 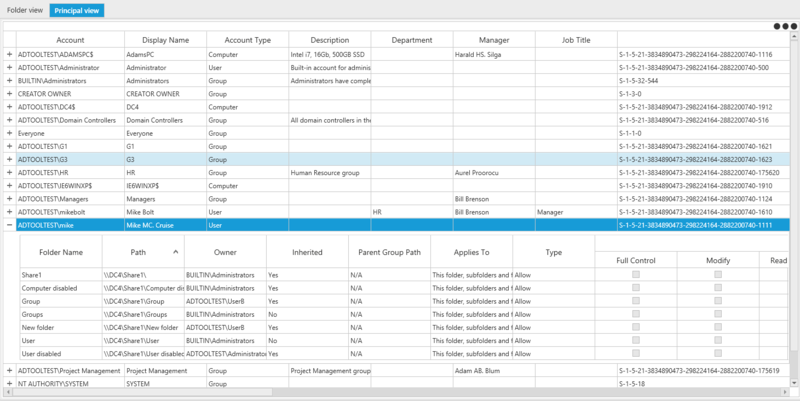 Each folder permissions row provides You with information like folder name, full path, owner, if there is inheriting permissions from parent folder, parent group name, applies to scope, permission type, basic permissions and advanced permissions. You can order and group data by any column.